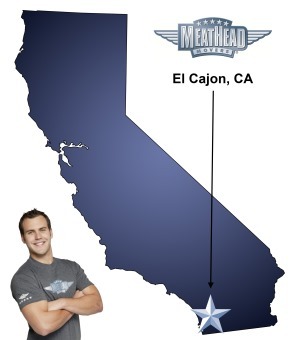 Meathead Movers is here to take care of the heavy lifting for you on your move to El Cajon. Our clean-cut student athlete movers are ready to get you safely settled into your new El Cajon home. Nicknamed “The Big Box” in reference to its Spanish name, El Cajon is a valley community located in southern San Diego County. Individuals and families moving to El Cajon will enjoy the wealth of services, recreation opportunities and natural beauty to be had in the greater San Diego area. If you’re considering a move, remember that our El Cajon movers can help take the stress out of getting your possessions to your new home. Spanish explorers arrived in San Diego early in the 16th century and quickly began building cities. By the early 19th century, Spaniards had found the valley where El Cajon is located and named it for its box-like nature. For residents of present-day El Cajon, this means that the city offers a wealth of interesting historical sites and buildings to see. The first commercial building ever constructed in El Cajon, the Knox House, is now home to a museum. Of course, El Cajon also offers plenty for those who enjoy natural beauty. Thanks to its valley location, El Cajon provides the perfect home base for those who want to explore nature trails, canyons, and beaches throughout San Diego County. The city’s Parks Department maintains a handful of parks and recreation facilities including a pool, skate park, and dog park. For those who enjoy participating in the community, the city offers great opportunities for civic involvement. A farmer’s market and annual Mother Goose Parade are among the city’s most popular events. Choosing our El Cajon movers is a great way to make the transition to this fun, lively community without too much stress. At Meathead Movers, we are proud to provide a broad range of moving services designed to meet your needs. Whether you need to complete a local, long-distance, or commercial move, we can help you get from your old home to your new one. For those who don’t have the time or energy to pack up possessions themselves, we offer Princess Packing services. Our moving teams are comprised of student athletes who not only treat your possessions with respect, but jog when not carrying boxes to ensure that they’re not wasting your precious time. We offer seven-day per week customer support and a moving concierge service to get you in touch with key service providers to help make settling into your new home easy. As your El Cajon movers of choice, we’ll be happy to give you a free no-obligation moving quote and start planning for your move. After all, moving to El Cajon should be a pleasant, stress-free experience. When you choose Meathead Movers you’ll enjoy reliable service with a 100-percent-satisfaction guarantee. Moving to El Cajon? Here are some helpful resources. View more El Cajon resources. I can't think of any specific thing to improve, I think they did a good job. I don't have much to compare them to, because it's been years since I hired another professional mover. Brandon, Andrew, Levi, and Ivan handled all aspects of the move efficiently and with respect for me and the items being moved. You, Meathead Movers, didn't disappoint--the question was how likely am I to recommend Meathead Movers (your service). I chose 5 because Having experienced your service from phone call to packing first hand, my recommendation would be dependent upon the situation of the services a friend or business is interested in. Let's face it, the services with a 4 or 5 hr minimum at the current rate isn't cheap so I would be hesitant just to make a recommendation for the sake of making a recommendation. Everything! I loved the website when I first checked you out; I loved how friendly and helpful all the people who answered the phone were. I loved the professionalism AND friendliness of Thomas and Kevin who moved me. It was a stressful day for me and their kindness and stalwartness made it so much better than it could have been. They were absolutely wonderful! I would recommend your company without hesitation. They were prompt, energetic, efficient, and friendly. Good work Princess Packers. The movers come on Sunday! Virtually EVERYTHING...but in particular, the two unbelievably strong and FAST and intelligent guys, Adam and Laramie, who moved from San Luis Obispo to San Diego CA all the worldly possessions (including one aged freaked-out cat who hid in a box spring over four days w/o food or water) of a very distraught woman who lost her husband to a heart attack during the move. It's still difficult for me to comprehend how two SUCH young men could possibly possess the compassion and empathy...and wisdom...these two wrapped me in to get me through my crisis. God bless and guide them throughout their lives...THEY ARE THE BEST OF THE BEST! Honors also go to Quentin, who toiled with Adam and Laramie during that first long, long day of the move.